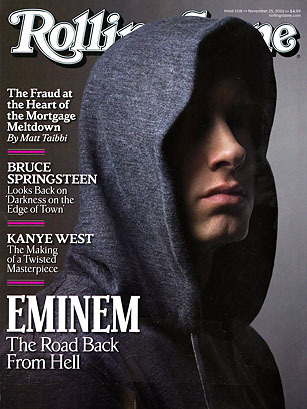 I like this cover not just because I'm a fan of Eminem (and had been wondering how he was going to get back from hell) but also because photographer Mark Seliger created an image that is so incredibly revealing without actually revealing much of Eminem's face. True, the former Slim Shady looks as if he should be wielding a lightsaber, but if you cover up all the headlines on the left, you can still recognize him  a testament to his star quality. It's an extremely impactful image that draws a complex celebrity from out of the shadows while leaving him in one.